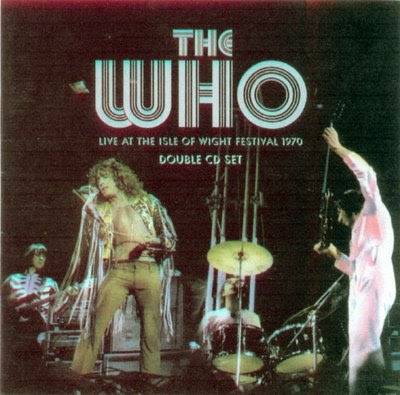 Live At The Isle Of Wight Festival 1970 is an official live album by The Who, recorded at the Isle of Wight Festival on August 29, 1970 and released by Sony in 1996. The DVD is very different from the CD. Differences include very significant cuts in the Tommy part of the show and in "My Generation", and, in addition, the video at many parts of the concert is not in sync with the audio. The Who were one year and three months into their Tommy tour when they played their second engagement at the Isle of Wight Festival. As in 1969, they played most of their famous rock opera, which by this time was quite familiar to the festival crowd. Their extraordinary rendition of "We're Not Gonna Take It/See Me Feel Me" was a highlight of the concert. Huge spotlights bathed the audience of some 600,000 attendees, and as The Who's tour manager John Woolf recalls, attracted "every moth and flying nocturnal animal on the island." By August 1970, Pete Townshend was already introducing new songs to the setlist including "Water", "I Don't Even Know Myself", and "Naked Eye." These songs, which were being recorded at the time of the festival, were intended for an upcoming project known as Lifehouse. Although Lifehouse was eventually abandoned, the sessions paved the way to the Who's classic album Who's Next. The Who also performed some live staples such as "Heaven and Hell", "Substitute", "My Generation", "Magic Bus", "I Can't Explain", and the perennial covers of "Shakin' All Over" and "Summertime Blues".